Triana Energy has a long history as one of the most skilled and aggressive exploration and production companies in the Appalachian Basin. The company is an independent, private enterprise, headquartered in Charleston, West Virginia, carrying-on a tradition that its management has been a part of for over 100 years. The Company’s management formerly owned and operated Columbia Natural Resources, one of the largest natural gas production companies in the eastern United States, until its sale to Chesapeake Energy in November 2005. The Company’s core management team came together again and added key skilled professionals in its effort to continue the Company’s fundamental mission. Triana Energy originally focused on proving the tremendous and previously unrealized potential of the Appalachian Basin and converting its discoveries into areas of significant productive capacity. Today’s Triana Energy continues to carry out that mission, including efforts to expand the geographic definition of the Basin’s proven producing region. Indeed, our geo-scientists are responsible for many of the new field discoveries in Appalachia over the past two decades. 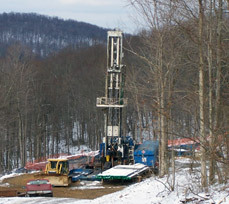 As a result, Triana Energy is one of the few companies in the natural gas industry that operates in all the major producing fields throughout the Appalachian Basin. Its extensive inventory of seismic and geological data is key to continued success in these critical exploration activities.